Mark Dibble, the CEO of YMCA Camp Ockanickon, Inc., was the featured speaker at the Sept. 7 breakfast meeting of the Medford Sunrise Rotary. Dibble talked about how the 110-year-old organization, located on Stokes Road in Medford, has evolved over the years into so much more than a summer camp. In addition to the summer camp programs — Ockanickon, the boys overnight camp, Matollionequay, the girls overnight camp and Lake Stockwell, the co-ed day camp — YMCA Camp Ockanickon, Inc. also runs School’s Out, a before- and after-school care program provided on-site at several local school, and the Outdoor Center, which provides environmental education, school trips, retreats, teambuilding, hiking, swimming, boating, archery and a host of other year-round activities. Ockanickon also holds family-focused programs and community events throughout the year, including various family camp weekends, Breakfast with Santa, Coach Bingo and memberships for year-round hiking, biking, swimming and boating. The 800-acre property features an observatory for night-sky gazing and a state-of-the-art ropes course and climbing wall, among other amenities. Dibble talked about the specialty camps run annually by YMCA Camp Ockanickon, Inc., including Camp Bright Feathers (for children infected or affected by HIV/AIDS), Camp Little Rock (for children who are blind or visually impaired), Camp Kesem (for children whose parents have or have had cancer) and Camp Firefly (a bereavement camp for children who have lost a loved one). Some of the issues that Ockanickon is committed to addressing through its strategic plan are summer learning loss, the childhood obesity epidemic, drug awareness and prevention, and serving diverse populations. “Besides providing a safe place for kids, we’re trying to serve the community in any way we can,” Dibble told the Rotarians. The chief executive officer, who started with the camp in the spring of 2015, said that Ockanickon recently implemented the YMCA organization’s HEPA (Healthy Eating and Physical Activity) standards, by cutting out sugary drinks and fried foods, providing healthier snack options, limiting screen time and promoting physical activities at both the summer camps and the School’s Out programs run by camp. “It’s all about moderation,” he said. The camp, he said, is also committed to serving needy communities such as nearby Camden, Trenton and Atlantic City by partnering with Urban Promise and other organizations committed to helping disenfranchised youth. Some school trips are subsidized in order to accommodate students who otherwise wouldn’t be able to experience the beautiful camp property in the pines. “This is the first year that we turned nobody away from camp,” Dibble explained. Last year, he said, the camp provided over $500,000 in scholarships and financial assistance, benefitting more than 700 children and teens. “We’re also partnering with organizations dealing with mental health issues and suicide prevention,” he added. During the Rotary meeting, Dibble was presented with a $3,500 check from Rotary to support the various camp programs at Ockanickon. 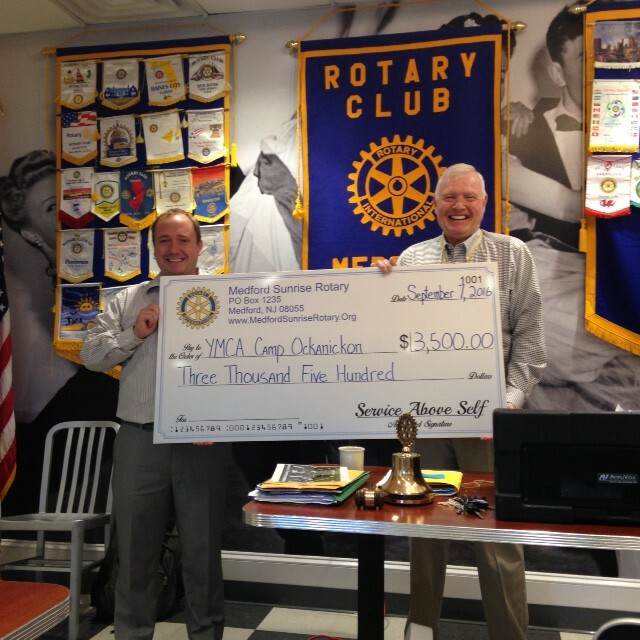 Rotarians raised the funds by holding a coin toss in the spring, and through a matching grant. YMCA Camp Ockanickon, Inc. will hold its major fundraising event, the annual Wine, Beer and Whiskey Tasting, on Oct. 14 at the Mansion in Voorhees. Proceeds from the fundraiser will provide scholarships to children who otherwise wouldn’t be able to attend camp. For information and to purchase tickets, email suzette@ycamp.org or call (609) 654–8225.